GAZA CITY (Ma’an News Agency) — Hundreds of Palestinians in the southern Gaza Strip on Friday were forced to evacuate their homes due to rising water levels, as winter Storm Huda began to take a toll on the besieged coastal enclave on the third day of its landing. Hatem al-Khur, an official in the Khuzaa municipality east of Khan Younis responsible for the displaced, said that 49 mobile homes had been inundated in the neighborhood of Abu Rida in his city, while 100 more families were living in destroyed homes that he deemed uninhabitable. “People are calling us for help and we are not capable of helping them after the recent war,” he said, highlighting that the families most severely affected by the storm had all lost their homes in Israel’s summer assault that left 2,200 dead and 110,000 homeless. He told Ma’an that locals are calling upon international institutions to intervene and end their suffering, as local officials lacked the resources to help. 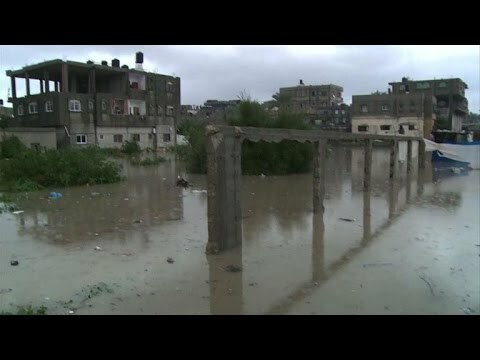 Muhammad al-Meidana, spokesman for Gaza civil defense teams, told Ma’an that other areas hit badly by floods were the al-Barahmeh and Obeida neighborhoods of western Rafah, where residents had to flee dozens of homes that were flooded by rain water. Several homes were also reported flooded east of Khan Younis, also in the southern Gaza Strip. Despite the hundreds displace, the flooding so far is less severe than many had feared, a relief for many residents already struggling against unusually low temperatures that have hovered a few degrees above freezing for the last few days. Civil defense authorities in Gaza called upon residents to remain inside their homes and not go out except in emergency cases for the second day in a row. On Thursday alone, defense crews told Ma’an that at least nine were injured due to the storm, including seven in roof collapses and two hurt after a water tank fell onto their home after being tossed by the wind from a nearby rooftop. For the 110,000 Gazans left homeless by Israel’s summer assault, the relatively low levels of flooding and the easing up of wind and rain since Wednesday has been a relief. With the storm expected to peter out by Saturday, many are hoping the worst is over. The Palestinian Ministry of Agriculture said Friday that initial reports of losses in Gaza’s agricultural sector as a result of the storm were still relatively slight, but warned farmers to continue taking precautions as rain and wind continued to buffet the region. The damage to farmers was felt across the Gaza Strip, with more than 80 greenhouses for growing crops damaged in the storm so far. Director-General of Planning and Policy at the ministry Nabil Abu Shammaleh said that the storm had damaged five greenhouses in the al-Fakhari area in Khan Younis, 40 greenhouses belonging to 70 farmers in Rafah, 35 greenhouses in Gaza City, and four greenhouses in Beit Lahiya. Abu Shammaleh added that a livestock farm has been flooded with rainwater during the storm, killing 1,500 chickens died in addition to destroying 20 metal enclosures for plants (equivalent to five greenhouses) in the central Gaza Strip. He said that average of rainfall since Thursday until 9:00 a.m. of Friday was 27 millimeters in the Gaza Strip, with the highest recorded rainfall of 37 millimeters in Beit Hanoun and the least in Rafah and Khuzaa at 7 and 10 millimeters, respectively. He warned, however, that if the storm continued over the weekend, it could bring dangerous consequences for livestrock farmers.